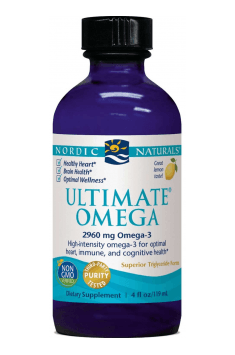 Nordic Naturals Ultimate Omega is a dietary supplement containing concentrated and purified fish oil obtained from wild sardines and anchovies. Fish oil is a source of essential unsaturated fatty acids from the omega-3 family, displaying a range of health-promoting properties. The addition of vitamin E and rosemary extract act as a natural preservative, increasing the persistence of omega-3 fatty acids. Owed to the patented method of anaerobic production, the manufacturer guarantees freshness and purity of the oil. The oil has been tested for the presence of environmental pollution, including heavy metals. The liquid formula ensures comfortable use. The product has an attractive lemon flavor, without a fishy aftertaste. Polyunsaturated fatty acids (PUFA) from the omega-3 family are essential ingredients that should be regularly delivered to the body with a diet. The best source of them is sea fish oil. The most important omega-3 fatty acids are eicosapentaenoic acid (EPA) and docosahexaenoic acid (DHA). These compounds are the precursors for the synthesis of an important class of biologically active compounds called eicosanoids. Eicosanoids are a group of tissue hormones, which include prostaglandins, prostacyclins, leukotrienes, and thromboxanes. These substances affect the functioning of the cardiovascular system, lipid profile of the blood or the regulation of inflammatory reactions in the body. Depending on the precursors available – omega-3 fatty acids or the prevailing in a modern diet omega-6 fatty acids – eicosanoids with different action profiles are formed. It is out of the omega-6 fatty acids, which include arachidonic acid, that pro-inflammatory and prothrombotic compounds are formed. In turn, omega-3 acids are the precursors for the synthesis of anti-inflammatory, anticoagulant and antiatherosclerotic eicosanoids. An excess of omega-6 fatty acids in the diet can inhibit omega-3 transformations, hence the optimal ratio between the two components is crucial. It has been proven that EPA and DHA can lower blood triglyceride levels by blocking their resynthesis in the gut and liver. As a result of, among others, inhibiting the production of thromboxane A2 and prostaglandin E2, omega-3 fatty acids reduce blood pressure. In combination with antithrombotic activity, omega-3 fatty acids are an important element in preventing the development of atherosclerosis, ischemic disease, and coronary heart disease. It was shown that omega-3 fatty acids, by joining the appropriate nuclear receptors (including PPAR, LXR, SREBP or NF-κB), may influence the expression of genes encoding proteins involved in lipid and carbohydrate transformations. For example, due to the activation of PPAR receptors (peroxisome proliferator-activated receptor) by omega-3 acids, there is an increased synthesis of lipid-degrading proteins. This leads to a reduced accumulation of lipids in the body, the excess of which underlies the development of obesity, type 2 diabetes or metabolic syndrome. Brain is one of the organs in which the highest levels of DHA are found. Omega-3 acids are part of brain cell membranes as components of phospholipids. DHA and EPA favorably affect the cerebral circulation and the fluidity of cell membranes, which is important for the optimal functioning of the nervous system, including cognitive functions. According to studies, the normal level of omega-3 can play an important role in preventing the development of depression. Omega-3 supplementation is particularly important for the proper development of the central nervous system in children. Supplementation of omega-3 acids reduces the increased level of inflammatory markers after an intensive training. Omega-3 acids may, therefore, accelerate the regeneration of damaged muscles and reduce DOMS. In conclusion, Nordic Naturals Ultimate Omega is a dietary supplement containing high- quality fish oil. Due to the environmental pollution, it is worth to consciously reach for a preparation that meets stringent standards of purity and freshness, whose analysis results are made available by the manufacturer and which is produced with respect for the environment. Fish oil is suitable for regular daily supplementation. It is recommended for people who are physically and mentally active, in prevention of civilization diseases, to support the cardiovascular system and the body’s immunity, and in a diet low in fish. One-half to one teaspoon daily, with food, or as directed by a health care professional or pharmacist. Fish oil is best taken with a meal containing fat. It is worth to include a preparation with vitamin D when supplementing with omega-3 acids. The product should be stored in a dark and cool place.